As the Fat Controller in the Thomas the Tank Engine stories would put it. My Ryobi Cordless Brad Nailer, I've wrapped it in masking tape to prevent a buildup of epoxy, and its worth being really careful about cleaning up the "nose" as a little hardened glue in there makes it unreliable. Great Machine, not so much for finesse or style but hey, its a "really useful engine". Ok, I admit it. I’m a serial boatbuilder, it’s an incurable thing that I just have to learn to live with. It means that I have almost always got a boat building project going in my shop, usually a small plywood boat but occasionally something bigger, plus there is the maintenance on the ship and repairs or helping out other people. One of the tasks that takes time and effort is holding pieces of plywood in place until the glue sets. When you think about it that takes a lot of time, clamps don’t always work, screws need pilot holes and generally need to be pulled out and the holes filled up later on, plus it takes more hands than I’ve got to hold the piece, drill the hole, then put the screw in. It’s a pain, and that’s without the issue of the screw being glued in by the epoxy and not wanting to come out when the time comes to remove it. I figure that saved us three or four hours per boat, a plank could be buttered up with glue, held in place and fastened in minutes, same with inwales, frames and “off” centercase assembly. The ability to just hold a piece in place, put the nose of the nailer up against the piece and pull the trigger, repeatedly if needed, and have it securely fastened is wonderful. Last SCAMP Camp, (August 2014) Howard came into the build at very short notice and had not time to bring his kit of tools with him. So, with my own shop in mind I went out and bought one for myself. I love it, great thing. What more can I say? A few words though, Home Depots on line catalogue advertised these as a full system, battery, charger and nailer, all in the same box. I printed off the ad, sent friend Beth off with the ad in hand to fetch one, and she did well. She figured out that there were no batteries in the box so bought two, but missed the fact that there was no charger. BEWARE. 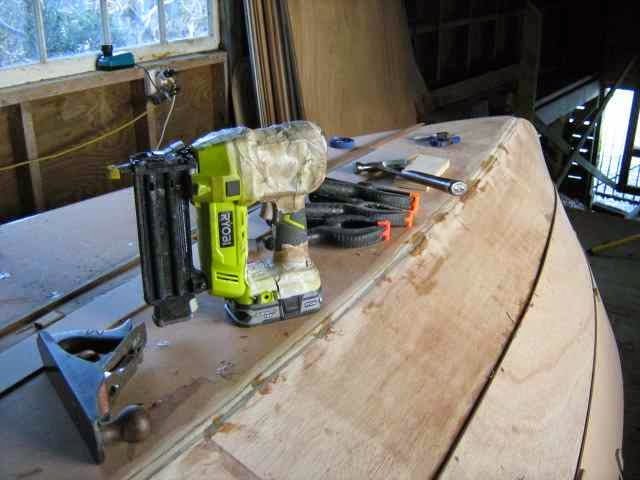 The tool itself is fairly cheap, but you need to budget on a couple of Lithium Ion Batteries and a charger in addition to the nailer, so the cost ramps up. Also, it’s seriously frustrating to get home with your new toy only to find that you cant use it without batteries or charger. Ten yard penalty Mr Ryobi! 20 yard penalty Home Depot. However, in use, (once I got all the bits together) its great, there are stainless steel brads available on line, mine are from Steelhead Fastenings and are 1in length stainless steel brads catalogue number STB181SS . They are fine little tee head pins that hold quite well even in edge grain plywood, and as the machine can be set to put the heads of the brads well below the surface of the wood its usual practice to leave them in there rather than pull them out. I also found out that there are plastic nails available from www.duckworksmagazine.com that will fit and work. Chuck Leinweber gave me a handful to play with and yes, they work on everything apart from really dense hardwood. You can plane them off, sand them, cut them with a chisel or saw through them, no harm to the tools. They hold ok although not as strong as the steel ones so you might need to pull the trigger twice to ensure that they hold, but its nice not to have to worry about the steel pins damaging your carefully sharpened tool. While I’m annoyed at both Home Depot and Ryobi about the charger and batteries not being included in the package as advertised, the product itself is a serious timesaver when building a small plywood boat. Points? The tool itself, probably an 8 out of 10, but the time saved is priceless.